Margaret, moving and inspiring just to read about this. This is how we end the violence. I was especially touched by the justness of your term “remorse”–always to be distinguished from it’s shadow twin, “guilt.” (To fully feel the former’s presence we must release the latter.) 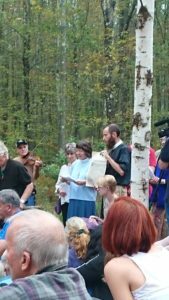 I loved the joining spirit of the ceremony–not self-castigation for our “sins,” but an embrace of universal compassion, our love for one another. No one embodies this spirit more than you and your colleagues in this ongoing spiritual adventure. Thank you, Dan, for your reflections. 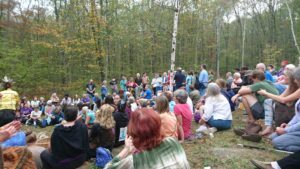 Since that extraordinary day at Agape/Standing Rock (“Standing Rock is everywhere”! ), I’ve been thinking about how reconciliation works. I’m thinking that it includes 1) willingness to listen deeply and with respect to the pain of the other, 2) willingness to recognize that I share the same or similar needs and feelings as the other: the other person is as real and precious as I am, and 3) willingness to apologize, acknowledge fault, and make amends however possible, setting out on a new path. 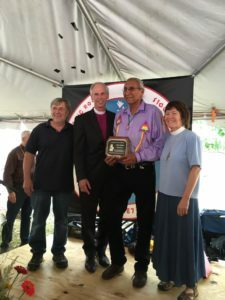 I will never forget what it was like to express the remorse of Christians as I looked across the crowd into the face of Chief Arvol Looking Horse. I will hold that moment in prayer for a long time. I am so grateful for the detailed reporting of the ceremony and the words you spoke which I hear in your voice. You brought water to the parched land. The rain today is reaching down to the roots of that little white pine. May that ceremony water shriveling spirits, across the land. Thank you, Judy. On this “Columbus Day” or “Indigenous People’s Day,” my prayer is that diverse communities will sit down and listen to each other’s pains, sorrows, hopes — and come to see each other as real and precious and fully human. Surely the way forward must include deep listening and humility. I am grateful for the soft rain that is falling today in New England, restoring life. 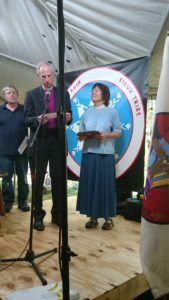 Thank you Margaret for bringing us all into the sacred circle of confession, repentance, and commitment to making amends for our past egregious betrayal of our Native American brothers and sisters. May we live to be worthy of their forgiveness. 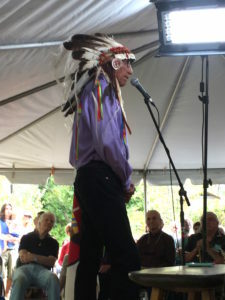 The ceremonies and talks, the testimony by people of all ages were deeply meaningful to me. 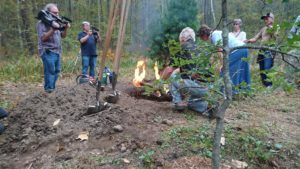 I feel deep gratitude to Brayton and Suzanne and the Native Americans who travelled far to get to Hardwick for giving us the opportunity to gather and participate in this gathering. 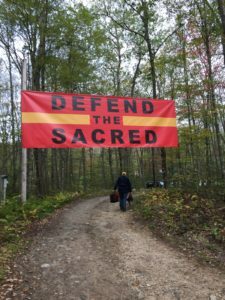 I think that the shared and the testimonies to Standing Rock and the awareness of the harassment at Sweetwater Camp were deeply moving and compelling–especially as they were given by people of all ages. And I appreciated the opportunity to share our grief and some redemption offered by those of us who are Christians and immigrants (even decades ago or hundreds of years ago) by you, Margaret. Thank you.